Room For More – How to Fit 6 Kids in One Room. 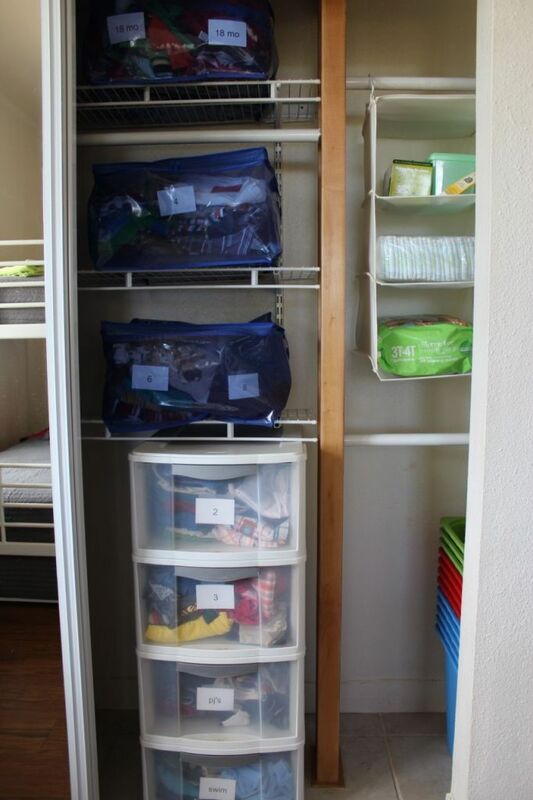 About 4 months ago, I started Googling “How to fit 6 kids into one room” and came up with all kinds of crazy suggestions that included: Knocking down walls for elaborate built-in beds; Hand building multi-story bunk beds; Hanging tiered beds from ropes on the ceiling; and I even found one site that suggested garage storage racks! Plus, our home has only 2 bedrooms, meaning we couldn’t split the kids up in multiple bedrooms. But we prefer a small house and like living simply. I love putting my kids to bed each night and hearing them giggle for a while… then in the morning, waking up to my oldest son reading to his brothers! I grew up like this and as a result, I am very close with my family – I want the same for my kids. And honestly, that’s the way most families survive here in Hawaii where rent is extremely expensive… it’s called the ‘Ohana’ way of living – where family makes the home, not the other way around. Since we rent our home, live on a budget, and needed a multi-bed solution (without installing garage racks), we turned to IKEA for inspiration and sure enough, found just what we were looking for! And, (we think) it worked perfectly! I thought I’d share it here in case anyone else might be in need of some ideas. Here’s a look at the new room from the door. Flashlights, Water & Books in with the leftover fabric from their bedspreads. I’ll try to post a photo of that when they’re done. The Trofast Storage from Ikea can be configured in several ways including bookshelves! Here is the trundle pulled out… the mattress is only 4″ thick, but it is comfortable! Other side of the room (and our only wall without windows). play comfortably, but without interfering with the low clearance trundle. 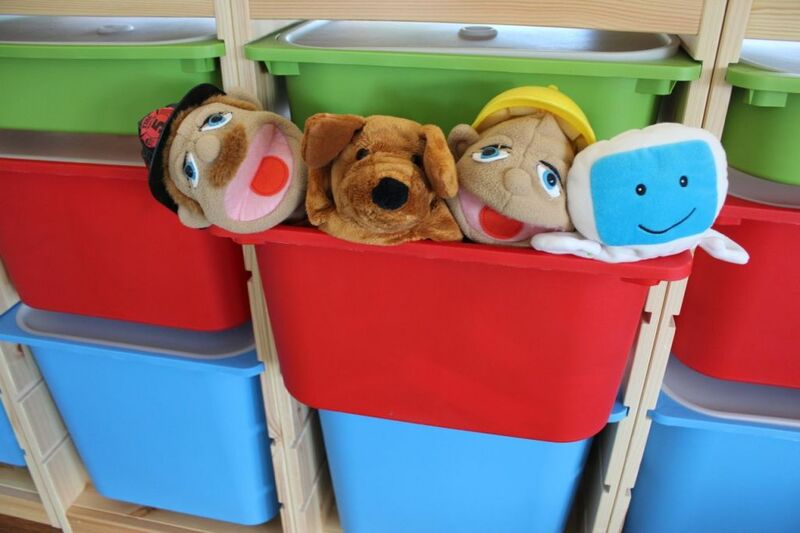 I love the toy storage! It gives us plenty of room for Legos, Cars, Blocks, Puppets & Trains! We opted for the colored bins, but they also come in a frosted white. We have one shallow closet for all the boys to share. The existing built-in rack is awkward, so we did our best to fit everybody’s clothes & supplies in there! been handed down or grown out of. There’s always someone whose next in line! 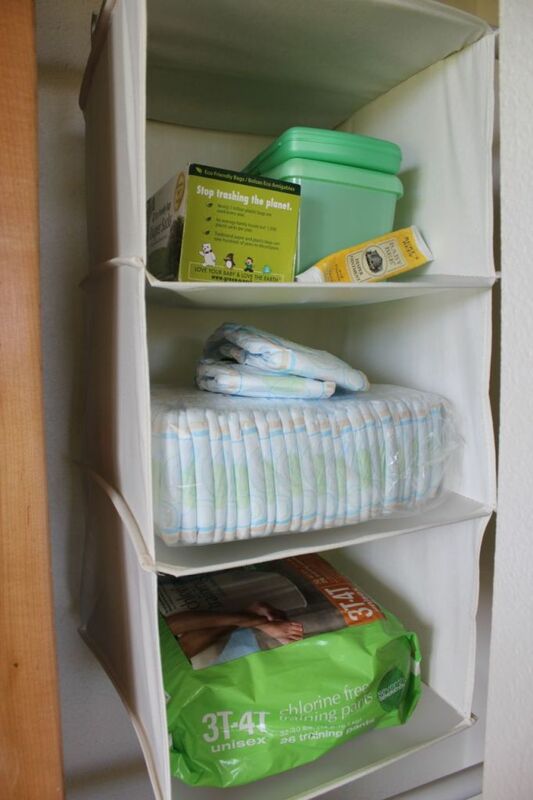 We’re down to just one in diapers (for now), and this is the easiest way for me to keep all the supplies handy. 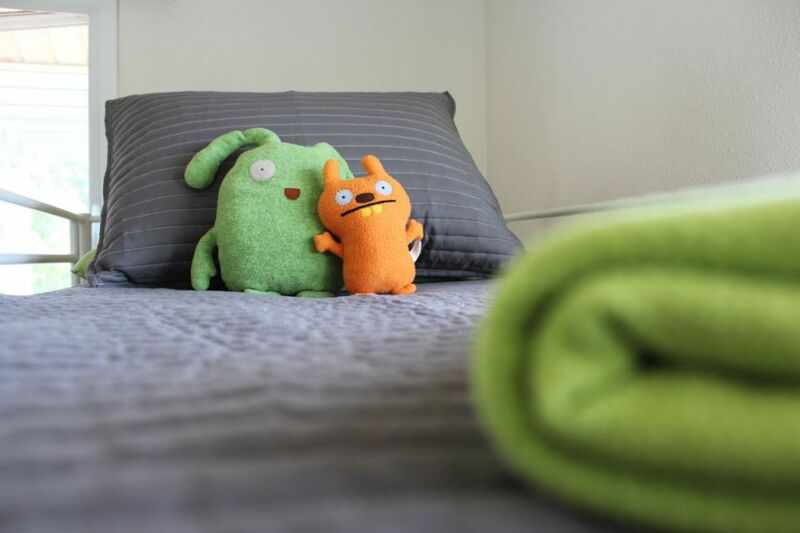 I don’t know why they call them Ugly Dolls, when we find them so cute! My boys got these as a gift and they love ’em! Although we could have probably done this cheaper if living on the Mainland next to an IKEA, we estimate that the total room update to cost around $1600 – $2000… but that is because most everything had to be shipped to Hawaii, and we opted for brand new mattresses. Hi, I just wanted to let you know that I just ordered a Vitamix through your link. I have been needing to replace mine for some time and finally did it. I am pretty involved with advocating for orphans (specifically ones with special needs at ReecesRainbow.org) and really wanted to help someone who is adopting but couldn’t find anyone who is a vitamix associate through my normal network of adopting parents so I turned to google. I chose your associate link because I saw that you have adopted. I know this is really odd and random, I just wanted to let you know where the random sale came from and why I chose you to buy it through. 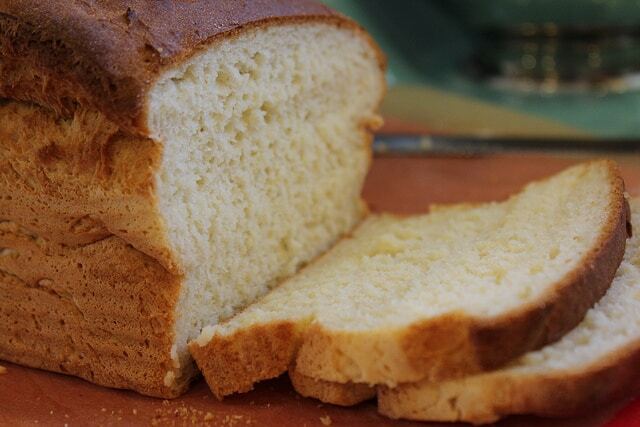 I look forward to looking around the blog and getting some recipe ideas. Thank you so much! 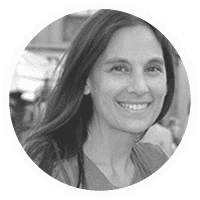 It was so thoughtful of you to consider buying a VitaMix through my link… Every little bit helps me to keep up this website and most importantly, it encourages me to keep going! 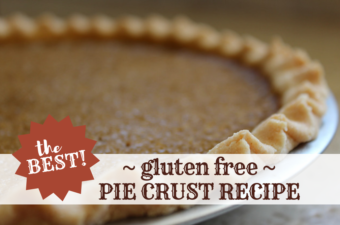 =) I absolutely LOVE your website/ministry! 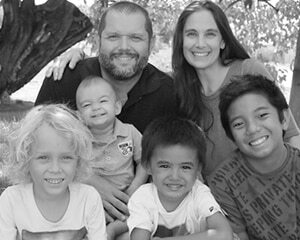 Even here in Hawaii, children are often overlooked for adoption because of their ‘special needs’… It’s so refreshing to see how you guys are advocating for these children & families! It looks like she is using the Svarta bunks and Svarta pull out beds. I appreciate you so much Erika. I am inspired by your testimony that shines through in all that you do. I also found the IKEA bunkbeds to sleep my 4 kids. It was helpful to see how you have organized everything. Odd that I am looking for multiple beds so we can fost-adopt, and your page here fits just what I am thinking of! Love the thought of having a “Bible, flashlight, and water bottle” stash for each kid. Their room looks wonderful! I am pregnant with our third child, and our two older boys currently share a bedroom while the other bedroom is their playroom. The playroom will need to become the nursery, and I’ve been racking my brain trying to figure out how to get our boys AND their toys in one room. I honestly thought we were going to have to move, but you have given me hope! Thanks!! just wanted to say you did an amazing job!!! wow room looks great! now are the kids clothes they wear daily in bins or in those bags in closet? 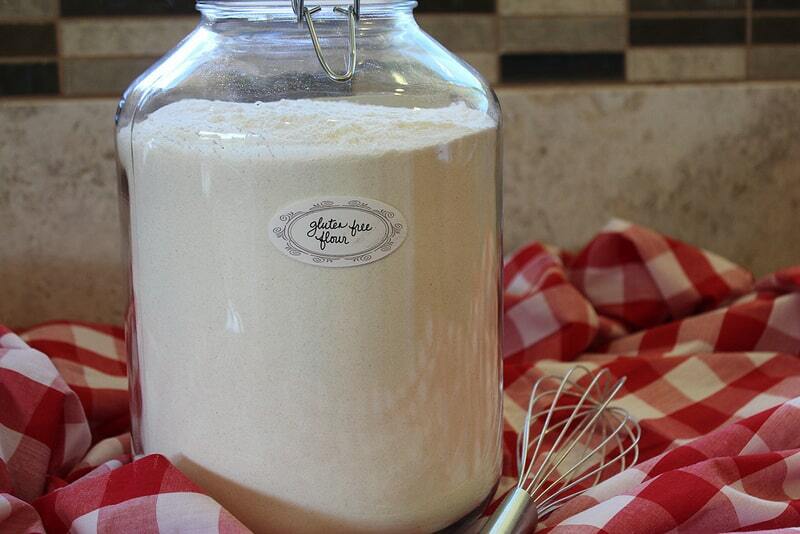 thanks for posting where everything came from not only functional but super cute! Thanks for the sweet comment! 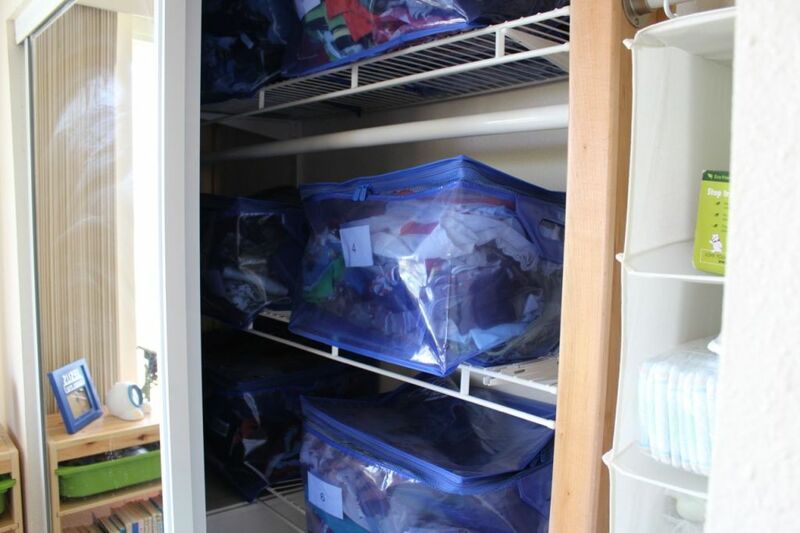 I put the daily clothes in the clear plastic drawer bins (or hung up in the closet for the bigger boys), and the clothes that are waiting to be handed down in the blue bags on the shelf. This way, I can rotate the sizes as they grow. Can you tell me the depth of the trundle bed from floor to top of mattress? Thank you very much. Hi are those mattresses from costco comfortable for an adult too? A decent firmness? Your kids room looks great btw . 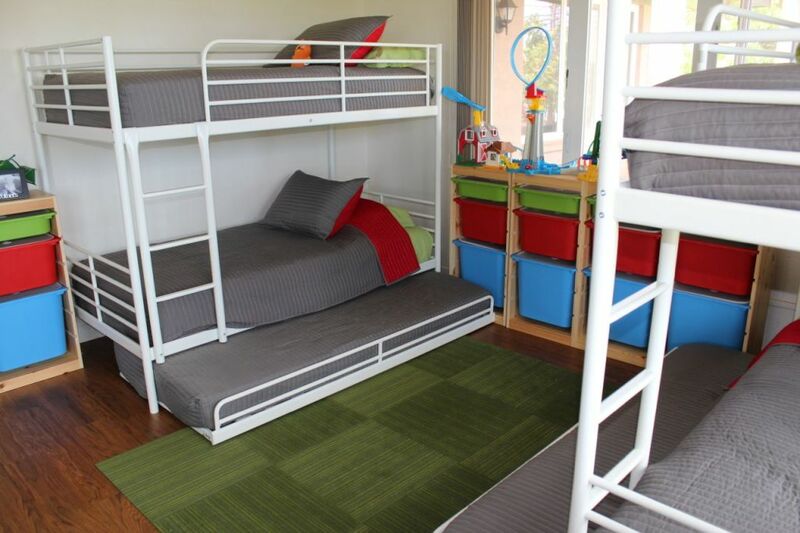 We are ordering the bunks from ikea next week and need to find a decent bunk mattress. I ordered one from sears but fear it may be too thick. Had been looking at the ones on costo website but was hesitant to order not being able to try 1st. I’m so happy to have found this bedroom setup of yours; I can’t wait to show it to my husband! 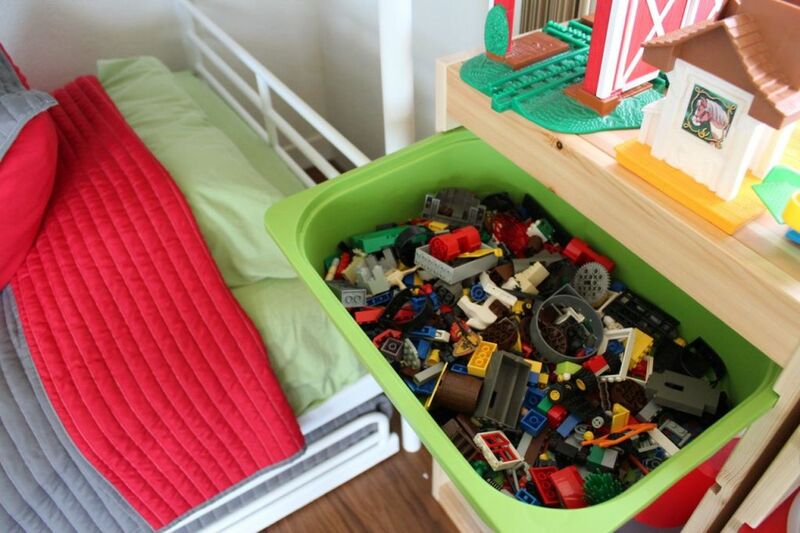 The measurements of our boys room is 12×14 (we gave them what would be considered the master) – it would also work in our smaller bedroom, but it doesn’t fit as many storage shelves… so depending on the room layout, this set-up might work for you. Aside from our own 4 boys, we’ve had all kinds of guests stay in their room including adults, and they all seem to fit & have a good nights sleep. I’ve fallen asleep in my kids room many times and I think the mattresses are super comfy and the bunks have held up well. 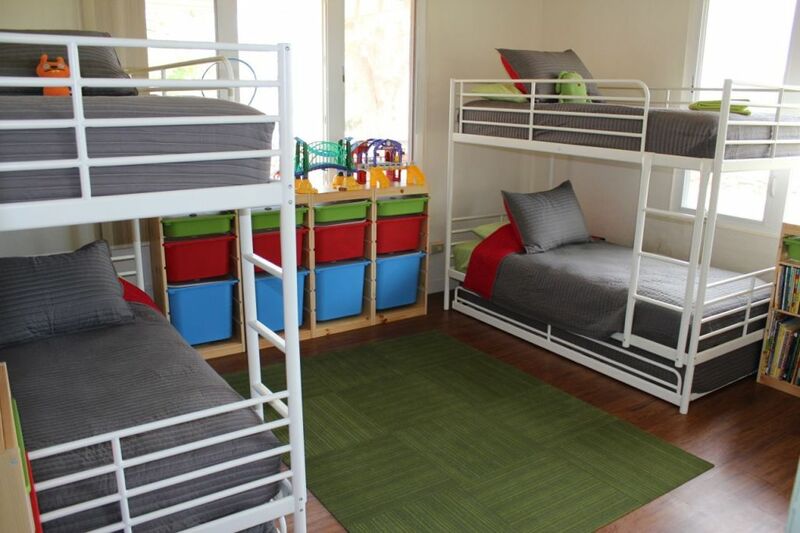 As my boys get bigger (and the little ones can be trusted on the top bunks), I actually think that moving the larger kids below is a better idea. This way, the big kids won’t disturb the little ones if they go to bed later or wake up early. Hope that helps – God Bless! My wife is almost 8 months pregnant with our eighth and we opted to make more room with Svarta bunk bed. We liked what you did with the twin bunk and pull out (we picked up the bunk bed today but the pull out was out of stock). We opted to go with the MORGEDAL mattresses as the bunks are for our older kids and we thought the thicker mattress would be more comfortable but it doesn’t seem like that mattress would fit on the Svarta pullout. You mentioned that the mattress was 4 inches thick – what would be the maximum thickness that the pull out can accommodate under the bunk bed? Thanks Erika! We’ll keep that in mind when looking for the mattress for the pullout. Great post., Their room looks great. Initially I wanted a wooden bunk with trundle bed for my three girls, but this Ikea one is such a good price so I’m considering it. Thank you. I’m doing it! All of it! Thank you. Got any bathroom ideas?! Hi Erika, I’m a mother of 7. 4 girls (4,4,2,8) and 3 boys newborn, 8, 1. We are downsizing to a 4 bedroom and we have a live in grandson we care for. Just wondering if you had any ideas on possibly fitting all those ages and different sexes in one room. Not sure if that’s recommended and if I should make that 45th a playroom. Do you kids play in their room? We also homeschool so 4th , if I could fit all in one room maybe could be playroom/schoolroom. What are your thoughts? Thank you for aharing. 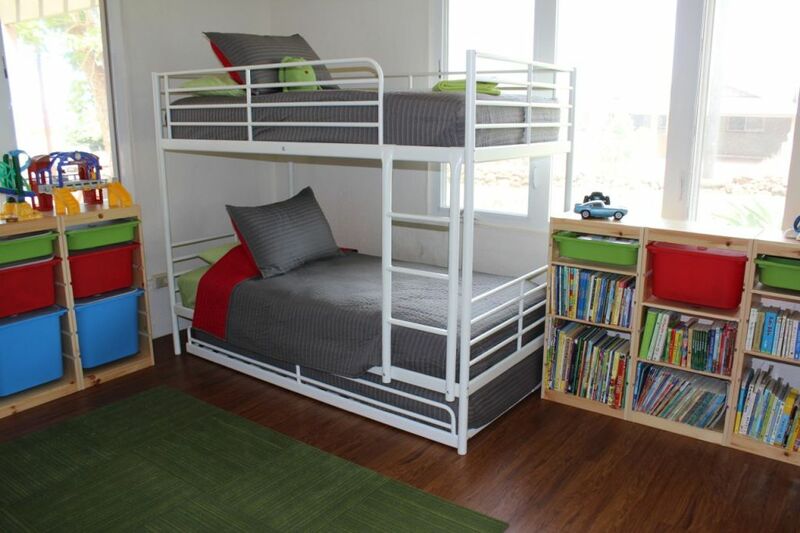 Do you know where to find these bunk beds online? I can’t seem to locate them on IKEA. Since kid’s rooms are comparatively smaller in size than the master bedroom, opting for space effective room furnishings is ideal. Kid’s trundle beds are ideal in this regard as they help make the room accessible by saving considerable space and also double up as a storage option. Thanks for this post. 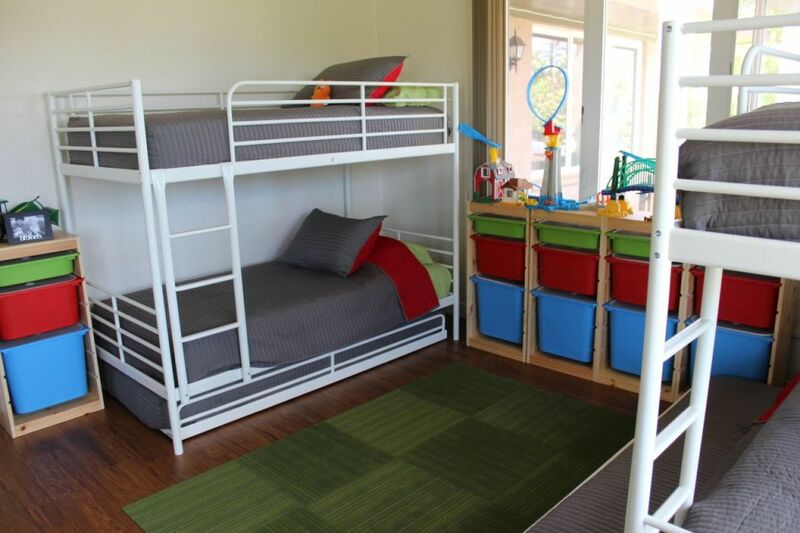 Have been working on a bedroom for 5 kids, also Pacific islands living, so difficult and expensive to get some things. Wanted the bunk trundle, but opted for a cheaper used bunk, with futon as the trundle! Love the carpet squares as an option. But where do your kids do homework? 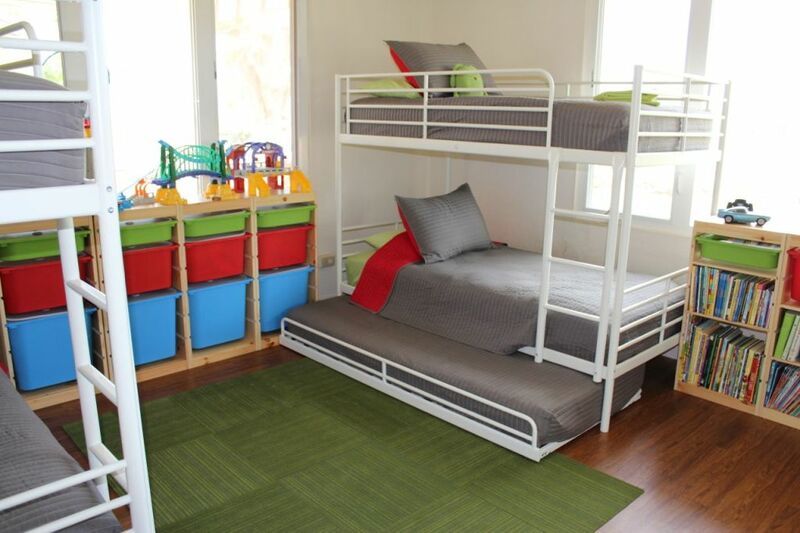 How are your bunk beds holding up? I’m trying to keep my three in a room that was meant to be an office, so that they can use the larger other room as a play room. Just looking into ordering this bunk but I’ve been questioned about how stable it is because its metal. I love the organization to this room! Congrats to you Erika. You have done a super job of fitting so many beds into one room which is not easy to do. Best of all it looks like you nailed how to keep the room neat and tidy. After searching for ideas this post so blessed me. My family of six is moving into a 2bed 1bath. 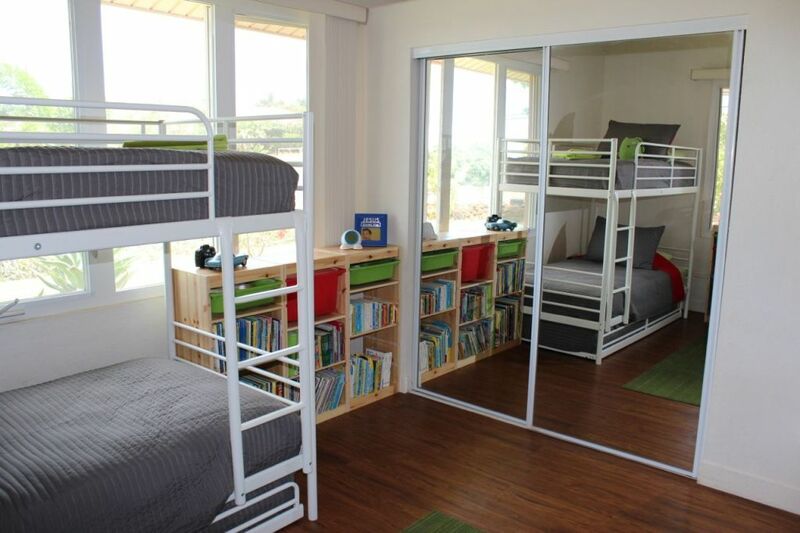 I needed real ideas not a 20×30 room with specially build beds shared by 3 kids.. When I I have half that and another bed to fit in. Thank you for sharing. LOVE! We are a family of 9 with kids ranging in age from 12 to almost 2. It has been quite a journey and now we are looking to move back into a house after over 3 and a half years living in a travel trailer. I am not sure what we will be able to find in our price range, and if we need to do a 2 bedroom, I wanted to be prepared with some possible storage and living solutions. This is a great idea. I’m also a fan of the triple bunks too. But, I REALLY appreciate getting a peek into your storage solutions! I know we can do whatever the Lord places before us, but often it takes a bit of creativity and ingenuity. Thanks for sharing! How is the trundle working out? Is it a good idea for everyday use? I have two kids and I am choosing between a bunk bed and a regular bed with trundle. I would like to know this as well :) With a toddler in the house I don’t feel safe with my twin girls moving to a bunk bed just yet.